So, with the “Dear Games Workshop” letter out the way, it’s time to think a bit harder about how the change to Flip Belts effects the army (none of the other changes really effects Harlequins, other than maybe the change to reserves). First question is – how important was jumping over models and terrain in the assault phase anyway? At the ITC Scottish Open we didn’t use the FAQ. However, I tried to keep track of the number of times I used Flip Belts in the assault phase. It was probably no more than half a dozen times in 5 games. So, perhaps not that big a deal. Having said that, my list doesn’t really rely on Troupes doing the heavy lifting in assault. All Troupes are in their Starweavers and only come out once screens are down, and there’s a juicy target to assault. Most of the power in the list comes from Fusion Drive Bys, the Ravagers and Skyweavers. However, the big loser in my list is the Solitarie. I use the Solitaire mostly as character assassin, weaving his way into formations and sniping out characters. It’s going to be much harder to do that post FAQ. On the flip side – the unit that got the biggest boost (all be it indirectly) is the Shadowseer. TBH, I was beginning to wonder about the Shadowseer. If it wasn’t for Twilight Pathways she would be looking for a job! However, I think Twilight Pathways will be even more important now in getting the Solitaire into the right spot in the psychic phase, rather than relying on getting him there in the charge phase. Other than that (! ), perhaps it wont effect my list too badly. It’s a much bigger nerf if you were running footslogging Harlies. Which is sad, as the effect of the FAQ will I suspect be to polarise army builds even more. Expect to see most Harlequin lists running Fusion Heavy Troupes in Starweavers, with Skyweaver support. Or even more extreme …. just a bunch of Skyweavers with Dark Eldar and Craftworld allies. But then again, that’s not really a Harlequin army, is it! But having said all that, I’m not going to change my list. I want to take it to at least one Tournament post FAQ to see how if works out. If I were to “guess” at changes, I might drop the Solitarie (which will make me very sad) and swap the Shadowseer for another Troupe Master, and add in more Skyweavers ….. or maybe a Farseer! So, I’m still on track to take Harlies to the LVO. My next Tournament is Rapid Fire in 2 weeks time. Rapid Fire is run by Stirling Wargamers and is one (if not THE) longest running event in Scotland. It will be a “GT”, in ITC terms (32 people), although I doubt they will submit the results. In the past I’ve been reasonably consistent in getting into the top 10, but never really threatened the top 3. I’ll be taking more or less the same list as I took to the ITC Scottish Open. I was going to “change it up”, but I’ve decided not to. I want to see how much the FAQ really has changed the army, and it would be more difficult to tell if I changed the list dramatically. Are you dreading going up against an Ork army packed with Tractor Cannons as much as I am? Going second against that will be a matter of damage control. Will lose all three Starweavers, plus whatever is nearby from the mortal wounds coming from forced explosions. 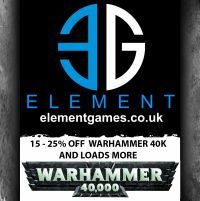 Nice of GW to make sure Harlequins don’t get too cocky with their “solid mid tier” ranking. Two big slaps in the face that basically circumvent the strengths our army is designed around: being able to weave through enemies with flip belts, and being hard to hit. I know I’m going to regret this …. but what do Tractor Cannons do? They auto hit. No hit roll, at 48”. -2 AP, which doesn’t matter for Harlies, but it’s basically a Krak missile that auto hits. If the target has fly, it does melta damage, 2D6 taking high roll. If it destroys a flying vehicle, that vehicle explodes. Good grief – that’s outrageous. Let’s hope there’s some sort of draw back that we haven’t seen yet.